Ruud Krol was on the glorious Ajax team at the beginning of the 1970s along with Cruyff, Neeskens and Keizer. He won the European Cup three times in a row, as well as the Intercontinental Cup. Krol started his professional career as a left full-back and later shifted to centre-back. He shone with the elegance and grace with which he defended. He stayed loyal to Ajax for a long period playing 339 matches in the red and white strip. 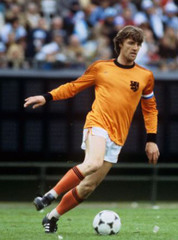 In October 1974, he became captain of the Amsterdam club. Krol was a versatile defender who could play anywhere that was required. He was a great reader of the game which also made him successful as a sweeper in the 1978 World Cup. The Dutch team of 1974 is always mentioned when people talk about great teams that never won the World Cup. Krol played in every minute in all seven games and also scored a goal, a cracking shot against Argentina in the 4-0 second phase win.